As England brings in pricing on plastic carrier bags, and Scotland reveals that similar changes a little over a year ago have reduced the use of such bags by 80 per cent, new research led by Heriot-Watt University in conjunction with Plymouth University will look at the effect which even the most microscopic plastic particles can have on the marine environment. While images of large 'islands' of plastic rubbish or of large marine animals killed or injured by the effects of such discards have brought home some of the obvious negative effects of plastics in the marine environment, it is known that there is more discarded plastic out there than we can account for, and much of it will have degraded into small or even microscopic particles. It is the effect of these latter, known as nano-plastics, which will be studied under a £1.1 million research project, funded by NERC and run by Heriot-Watt and Plymouth Universities. The project, RealRiskNano, will look at the risks these tiny plastic particles pose to the food web including filter-feeding organisms like mussels, clams and sediment dwelling organisms. It will focus on providing information to improve environmental risk assessment for nanoplastics, based on real-world exposure scenarios, replicated in the laboratory. Team leader Dr Theodore Henry, Associate Professor of Toxicology at Heriot-Watt's School of Life Sciences, said that the study will build on previous research on nano-material toxicology, but will provide information which the earlier studies did not include. "Pieces of plastic of all sizes have been found in even the most remote marine environments. It's relatively easy to see some of the results: turtles killed by eating plastic bags which they mistake for jelly fish, or large marine mammals drowned when caught in discarded ropes and netting. "But when plastics fragment into microscopic particles, what then? It's easy to imagine that they simply disappear, but we know that nano-particles pose their own distinct threats purely because of their size. They're small enough to be transported throughout the environment with unknown effects on organisms including toxicity and interference with processes of the digestive system." An important component of the project to be investigated by Dr Tony Gutierrez at Heriot Watt will be the study of interactions between microorganisms and the nanoplastics to reveal how these interactions affect their fate and toxicology. Professor Richard Thompson, of the School of Marine Science and Engineering at Plymouth University, is a world-leading expert on plastics in the ocean, and will be orchestrating the Plymouth side of the project. ''There is considerable concern about the potential effects of microplastic in the environment," Richard said. 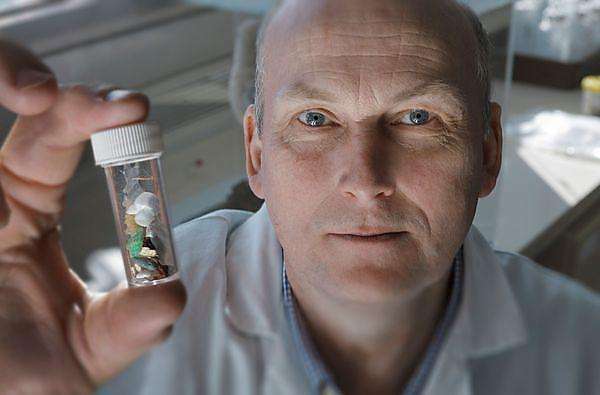 "Work at Plymouth University has shown this debris can form by the fragmentation of larger items such as plastic carrier bags and from the direct release of small particles from cosmetics. We have shown microplastic debris is present in marine habitats worldwide and that it can be ingested by a wide range of marine organisms including commercially important species. This new funding from NERC will allow us to investigate even smaller particles of plastic debris within the nano size range." Working alongside Richard will be Steve Rowland, Professor of Organic Geochemistry, in the School of Geography, Earth and Environmental Sciences, and an expert on identifying complex chemical pollutants in the environment. "It will be challenging to work with such tiny plastics particles on the nano-scale, but it is important that we investigate real world scenarios as we need to test whether they are impacting the environment and marine life or not." The aim of the project, said Dr Henry, is to provide the information which is needed to effect real change. "We simply don't know what effects these nano-plastic particles may pose to the marine environment, to filter-feeders and on to fish, and through the RealRiskNano project we aim to provide this urgently needed information to the people whose job it is to assess risk to the marine ecosystem and decide what steps need to be taken to mitigate it." Although the researchers say they don't know the effect of nanoparticles of plastic come on the marine environment, they can't imagine that the nine as much larger pieces of so-called "microbeads" have been shown to be ingested but not digested by fish leading to their death, and probably the larger predators that eat them as well. This destroys any ecosystem the plastic gets into.